Left: A reconstruction of an adult Neanderthal. Right: A non-reconstructed, actual human girl. Compared to modern humans, Neanderthals had heavy eyebrows, huge noses, and large, long faces that bulged forward. Using 3D computer models, an international team of scientists has analyzed these facial features in detail, uncovering some likely explanations for these dramatic physical differences. Neanderthals and modern humans, or Homo sapiens, diverged from a common ancestor sometime between 700,000 and 900,000 years ago. After this fateful divorce, the two human lineages were on their own, embarking upon different evolutionary paths. As our immediate ancestors continued to evolve in Africa, Neanderthals migrated to Eurasia, where, over the course of hundreds of thousands of years, they lived and bred through the ebbs and flows of several Ice Age periods. During this time, the Neanderthals likely acquired specialized physical characteristics that helped them tolerate the harsh conditions, but for reasons that still aren’t entirely clear, they died out some 40,000 years ago. Reconstructed Neanderthal man and woman, as seen at the Neanderthal Museum in Germany. From fossilized evidence, we know that Neanderthals didn’t look like us. Though still technically human and featuring very human-like characteristics, they were shorter, more robust, and physically stronger. But they also featured distinctive faces, with heavy brows, weak chins, a large, forward-projecting face, and a wide nose. Some of these characteristics, such as the brow and chin, were likely acquired from their ancestors, but the other features are so distinctive that paleontologists figure they must’ve evolved for a special reason. New research published today in Proceedings of the Royal Society B suggests this is very much the case, and that Neanderthals acquired a facial structure that made life during the Ice Age more bearable. Prior to the new study, scientists had developed three different theories to explain the distinctive Neanderthal face. One thought was that the facial structure enabled heavy biting, allowing the Neanderthals to use their teeth as tools, and to chomp down on all that tough mastodon and rhino meat. And in fact, this hypothesis has been taken very seriously, as fossil evidence shows heavy wear on Neanderthal teeth. Another idea is that Neanderthals were better at drawing in cold air, using their large nasal cavities to warm and humidify the air before it reached the lungs. This notion is a bit more controversial, as airway size may relate to an animal’s respiratory demands (i.e. heavy breathing during exertion) and not climate. Lastly, and on a related note, the large airway passages may have allowed for so-called “turbo breathing,” allowing Neanderthals to take some extra gulps of air while performing strenuous work, or when burning significant amounts of calories to keep the body warm (and in fact, it’s been estimated that Neanderthals burned an average of 3,360 to 4,480 calories per day, compared to modern humans, who tend to burn between 2,000 to 3,000 calories a day). 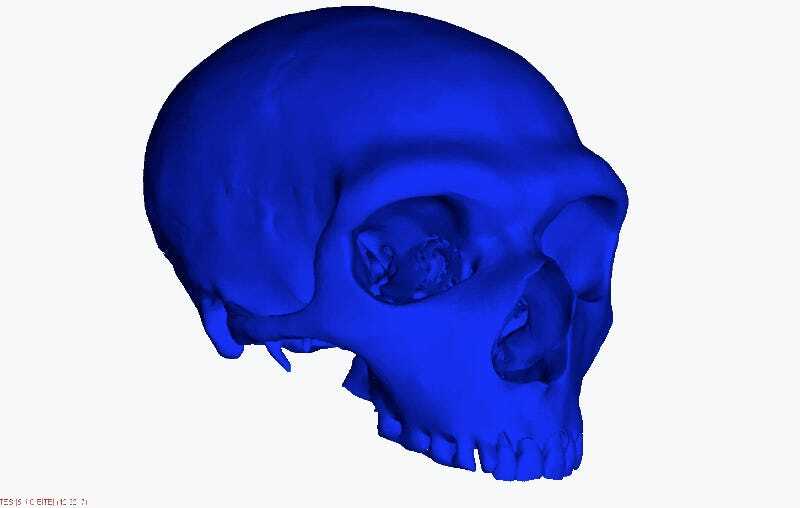 3D computer models of Neanderthal skulls used in the study. To test these three hypotheses, an international team of researchers led by Stephen Wroe from the University of New England in Australia used CT scans to build three-dimensional computer models of Neanderthals, modern humans, and a closely related group of extinct humans known as Homo heidelbergensis (a possible last common ancestor of both). The team added this “archaic” human to the mix to see which traits may have already existed in both Neanderthals and modern humans prior to divergence. The researchers then digitally “crash tested” the virtual skulls to see how the various theories would hold up, submitting the models to various stress tests and airflow evaluations. Looking at the study’s findings, the models showed very few differences in chewing capacity between the three human species tested. An in fact, modern humans appear to be better equipped for heavy biting than Neanderthals (a finding that even surprised the researchers). This means the “big chewers” hypothesis for Neanderthal faces is now seriously in doubt. The other two theories, however, fared a bit better. Strain during the Neanderthal bite. The nasal cavities of Neanderthals, and especially those found in modern humans, were shown to condition air more efficiently than H. heidelbergensis, which suggests both species evolved to withstand cold and dry climates. Most strikingly, however, the scientists found that Neanderthals could move more air through their nasal pathways than either H. heidelbergensis or H. sapiens. Exhalation comparisons, showing differences in temperature. In terms of limitations, Wroe admitted that his team’s results were based on computer models, and that assumptions made in modeling could eventually be refined by new work. Also, he said their findings were based on a “pretty small” data set, and that more fossils would help his team to further confirm and refine their hypotheses. Robert G. Franciscus, an anthropologist at the University of Iowa who wasn’t involved with the new study, is very familiar with this topic, having studied Neanderthal facial characteristics for decades. Speaking to Gizmodo, he said the authors of the new study made good use of the limited fossil record to explore the three preexisting hypotheses, but he admitted the study wasn’t perfect. Franciscus also said the estimates for Neanderthal body mass might have been overestimated, but in general he said the study was strong and its findings not altogether surprising. Neanderthals may have differed in their looks compared to us, but they were remarkably similar in terms of behavior. Traditionally, they were thought of as dimwitted brutes, but as we’re learning, this is far from the case. Neanderthals buried their dead, had flexible diets, used body art, and were among the world’s first artists, depicting animals and other objects on cave walls a full 20,000 years before modern humans did the same.